SUN BAT YAM is an exclusive, one-of-a-kind luxury five star hotel, that is striking in its architectural style; a prime example of innovative initiatives. This unique luxurious complex is encapsulated within a multi-facility towers that are spectacularly positioned on a radiant, virgin beach front. This marvelous site brings to life a new elegant vision of the future Israel by providing an all-encompassing luxury life-style experience. 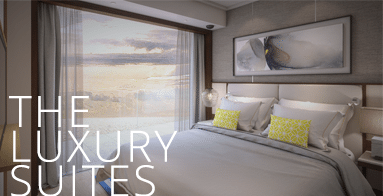 A precise and exquisite combination of a dream location and access to a wide range of formidable five-star hotel services and facilities, that are geared towards inspiring us to live a healthy life to the max. Imagine stepping out onto your panoramic balcony and beholding the breath-taking view of the vibrant blue Mediterranean Sea, feeling the warm sun against your skin and the soft golden sand under your feet. This world-class hotel resort complex includes over 200 rooms, a 4,000 square meter stretch of upscale international brand stores, boutiques, fine restaurants and elegant cafe’s, alongside a 3,000 square meter, cutting-edge rejuvenating Dead Sea Spa where you can bath in genuine dead sea water and receive unique dead sea scrub treatments. The Spa is conjoined with a lavish Fitness Center that includes a gymnasium and an indoor semi-Olympic swimming pool that overlooks an outdoor 80-meter Infinity Pool which stretches into the majestic Mediterranean horizon. The complex also has a fully-equipped high tech Business Convention Center. With a 1500 attendee capacity and an exquisite panoramic view of the sea, the center is the perfect setting for international events and business conferences. SUN BAT YAM was designed to offer you a lush and revitalizing holistic experience that accommodates your every need, from a Wellness Juice Bar and a modern hair salon to an onsite synagogue. 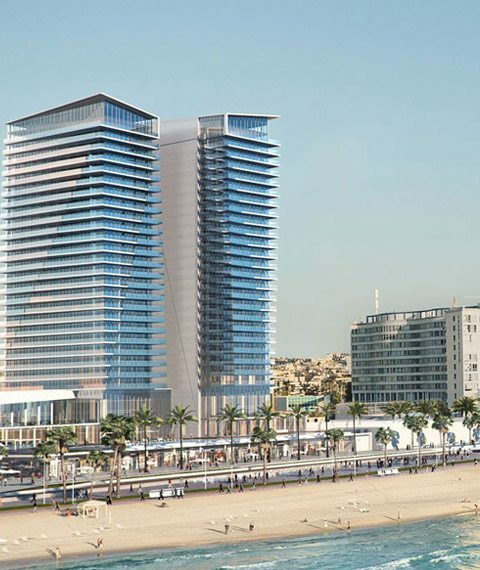 SUN BAT YAM was impeccably designed by Feigin Architects, leading specialists in the the leisure sector. 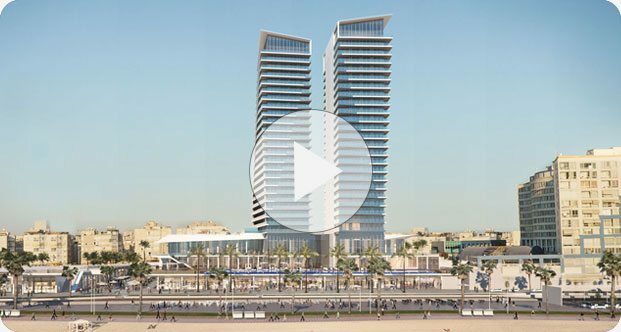 Some of the firm’s recent notable projects include: Sarona, the stylish open-air commercial center in Tel-Aviv, The Waldorf Astoria hotel in Jerusalem and the renovation of the David Inter-Continental Hotel in Tel-Aviv. Ara Design, a leading international high-end interior design company, is responsible designing SUN BAT YAM’s exquisite interiors. SUN BAT YAM is a unique hotel project that is designed to the finest detail and fitted with exclusive contemporary furnishings and a balcony overlooking the magnificent sea as it recedes to the horizon. 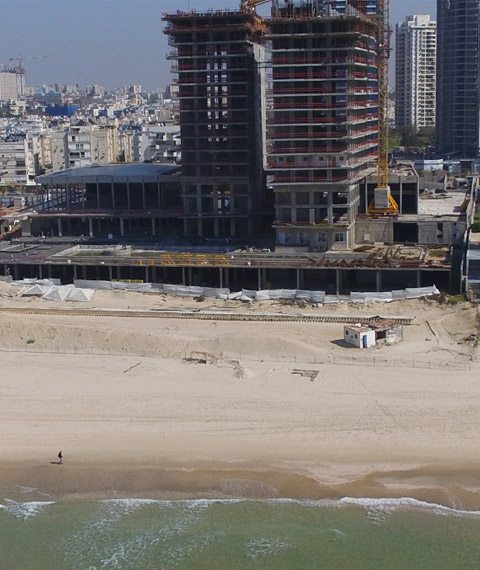 SUN BAT YAM is truly a rare architectural gem, since it was strategically built on a golden, untarnished shoreline. View floor plans of our luxury rooms and marvel at one of the most innovative and impeccably-designed hotel resort projects in Israel. 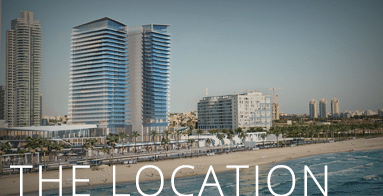 This exquisite one-of-a- kind exclusive project that is set in Bat-Yam’s flawless, golden shoreline is only a ten-minute drive from Israel’s hip Tel-Aviv, and 15 minutes from Ben Gurion Airport.